Visit us at the new Surf House in Caparica. Amazing location with a great mix of inner city Lisbon flair & beach holiday. The Surf House in Caparica offers the perfect trip for those of you who love both the beach, surfing, yoga, and relaxing but also enjoy being close to the hustle and bustle of a major European city. Caparica offers just that, in less than 30 minutes you can be transported from perfect waves, golden sand and a chilled atmosphere to Lisbon inner city with its metropolitan flair, art, amazing food and culture. The Surf House not only gives you access to all of these things, but also provides a delicious and healthy daily breakfast buffet, comfortable accommodation options for all types of travellers, whether it be solo travellers looking for a cheaper option in one of the dorms, or couples looking for a romantic week away in one of the Double Rooms with ensuite. Send us an enquiry today to see if we have space for you this season! Around the camp you have 13km of sandy beaches with what seems like an uncountable number of surf breaks. Costa da Caparica is on the other side of the Tejo River and is connected to Lisbon via the iconic Ponte 25 de Abril suspension bridge. The area is essentially the home break for Lisbon. Getting to Lisbon is a breeze; you just catch a short bus to the ferry, which then takes you directly across to the city centre, the trip in total takes around 30 minutes. The lodge itself is in a quiet neighbourhood so chilling in the pool, garden, or even your room, can be just as relaxing as doing the same on the beach. Along the coast you can find amazing, traditional restaurants and bars with everything being easily accessible by foot or bike. There are also supermarkets and shops in the area. Leblon on São João beach is the perfect spot to refresh after your time spent out in the waves. You can order a snack and drinks while enjoying chilled lounge music, a relaxed atmosphere and an amazing view. Every Sunday in the peak season there is an event called Sunset Sessions where a DJ comes to play, and great cocktails are served. Here you can find everything from souvenirs to vintage pearls. Every Sunday starting at 9 you’ll find locals selling almost everything along the beach. If you’re lucky you might even find some pirate treasure. If you decide to rent a beach cruiser from the lodge, you can ride them all the way to Trafaria. There you can jump on a ferry and you will be right in the heart of the Bélem district of Lisbon. There is a local delicacy called Pasteis de Bélem which is well worth trying and if you want to do some sightseeing, you can check out the Church, Santa Maria de Belém or Bélem Tower which protected the Lisbon harbours northern side from invading ships. Decio has been the manager of Eco Surf Lodge Caparica for the last 5 years. He still takes the surf lessons and as he is a local, will be able to give you some insider info about secret surf spots and the conditions to get you to the best waves. Back at the camp he’ll also be more than happy to help with any question you might have about Lisbon, or the surrounding area. Petra has been at the camp for the last 2 years and has learned a lot about Costa da Caparica, Fonte da Telha and Lisbon, including where the best cafes, restaurants and bars are located. She is always willing to help and answer any questions that might come up. If she has time she’ll also join you out in the surf. At the Surf House you have the option of an 8 Person Dorm Room, Double Room & Double Room with ensuite. The comfortable, spacious, and newly furnished Double Rooms either come with an ensuite, or for a slight discount, a shared bathroom. All the bathrooms, regardless if shared or private are clean, modern and well equipped. The rooms have either one comfortable Double Bed or 2 Singles. The 8 Person Dorm Room at the Surf House Caparica is a Budget friendly alternative. The room has 2 bathrooms so there is plenty of space for everyone. It doesn't matter whether you are in the Dorm or Double, each guest is supplied with bathroom towels, so you get a little extra space for your surf gear in your bag. The surf course takes place on the São João beach in front of Eco surf Lodge during the Portuguese summer months. Here you’ll be greeted by amazing, empty waves that are perfect for both learning and advancing your surfing. Eco Surf Lodge gives you the chance to experience the real feeling of surfing. The 10 & 15 hour surf courses run from Monday to Friday, and you head to the water after breakfast. If the conditions are better later the coaches will shift the time to make use of the best waves for you and your skill level. The courses are aimed at getting you up and standing on your first waves, as well as getting you feeling comfortable in the water. You will also learn some things about the ocean, tides, surf conditions and the equipment. During this course you’ll develop your skills and move on to explore more advanced surf spots, such as reef and point breaks, while working on your turns and positioning. The coaches will be out with you to give you pointers on your surfing and insider info about the best take of zones and the waves in general. The local surf coaches have over 20 years of surfing experience and know the ins and outs of the Caparica coast. This local knowledge will mean you get to go to the best breaks for your level and develop your surfing skills quickly. Safety and fun are always paramount to any surf lesson, and the crew want to push your surfing, so the aim is not to make the classes too easy and boring, but also not too push to much to a point where you feel overwhelmed. Surfboard and wetsuit are included in whatever course you decide to do, and if you are not ready to commit to a 10-hour or 15-hour course, you can take a single day, 2-hour class, for 30 € that also includes gear. The Portuguese Rita actually stood up on her first wave in Holland, but has been surfing the Atlantic for the last 10 years and has learned the ins and outs of the coast. Rita splits the class up making sure everyone gets the help they need and progresses quickly while having a lot of fun. Paulinho is a born and raised local of Costa da Caparica and life is surfing. His relaxed and funny attitude means you’ll be feeling ultra relaxed in the water, or laughing hysterically. He’s been surfing the coast for more than 20 years so he’ll mould you into a real surfer in no time! You also have the option of just renting a board and wetsuit and heading down to the beach at your own leisure to surf. There are a variety of boards at Eco Surf Lodge including longboards, high performance shortboards and a few retro fish boards as well. There is also a big selection of wetsuits in various sizes. The cost for a surfboard is 25 € per day, or 85 € for the week. You can also do a package deal with surfboard and wetsuit for 35 € per day, or 125 € per week. The beach in front of Eco Surf Lodge & the Surf House is called Paraíso and provides consistent surf, with a variety of peaks that offer waves to suit anyone from the first timer to the experienced soul surfer. CDS is also nearby which is a consistent beach break with numerous breakwaters that provide long rides both left and right as well as A-frame peaks along the beach. Along the 13 km stretch of beach from Lisbon to the edges of Caparica you have an abundance of places to surf including point and beach breaks for all levels. And if you have a car you can drive further north and explore spots around Peniche and Ericeira for even more variation. The water temperature in the Atlantic Ocean hovers just over 20°C in summer so a 3/2mm wetsuit or even spring suit is best. In winter water temperature drops to around 17°C so 4/3mm full suit is required. At the Surf House in Caparica you’ll be spoiled with the delicious daily breakfast organised by the crew that takes place in the larger dining area at the Surf House. The team pride themselves in getting your day started right by finding a large variety of the freshest organic ingredients that are locally produced. Daily you’ll be greeted with fresh fruit, muesli, fresh bread, cold cuts and cheese as well as freshly brewed coffee or tea. There is also juice and water available in the mornings. You can enjoy breakfast either inside in the dining area or out on the patio by the pool in the morning sun. Four times a week the Surf House crew prepare a spectacular meal using local seasonal ingredients. They buy everything they need fresh from the organic market and prepare the meal while you are out in the surf. The menu changes weekly but it always includes 2 evenings where the BBQ will get fired up and some great marinated meat, fish, and vegetables get cooked by the grill master. There are always salads and sides, and a glass of local Portuguese wine and water to accompany the meal as well. We recommend this option as it takes the stress out of searching for a place to eat after a long day of surfing and only costs 59 € for 4 meals. In the township of Caparica you will find plenty of great cafes and restaurants that serve local and international meals. There are some great spots that serve some of the freshest seafood you are likely to find. The Surf House offers Yoga in a brand new yoga room with a panoramic ocean view, and professional yoga instructors. Yoga is the perfect activity to improve your surfing skills. Yoga works your core, improves flexibility, it develops your sense of balance, gives you control over your breathing and relaxes the mind, all of which are vital to becoming a great surfer. Yoga will also loosen those muscles that have been vigorously worked during the days paddling and get you prepared for tomorrow. The classes either take place on the beach or in the garden in the morning or evening when the sun, and temperature, is lower. The class with a qualified yoga teacher costs 10 € and requires a minimum of 3 participants. There are also yoga packages available if you are looking to take part in daily yoga sessions. Yoga is on offer between the 24th of March and 13th of October. Take a peek at Lisbon life! 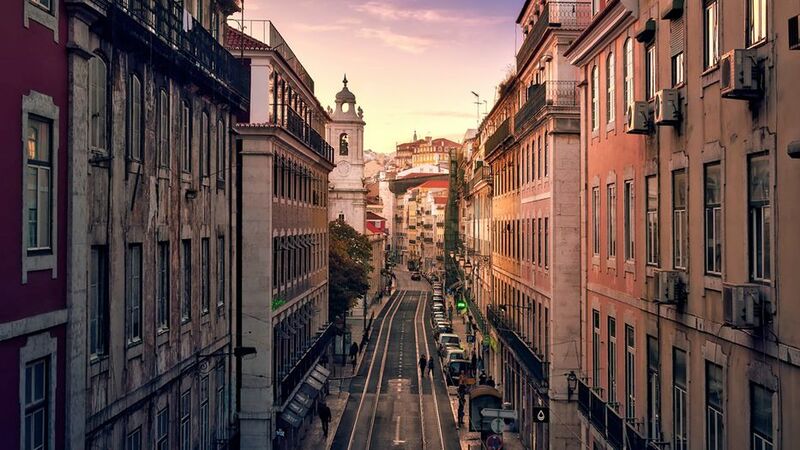 The team can arrange a and organised trip to Lisbon every week, which is included for all the guests, so you and your new surf buddies can go party, eat, shop, in the Portuguese capital. The city has some of the best restaurants, nightclubs & bars in the world, but is also rich in history and has an abundance of historical sights to explore. If you have a rental car, the UNESCO city of Sintra is around 60 minutes away. This city is rich in history and culture and once there, you will see amazing castles, forts, secret gardens and palaces. The town is also set amongst some of the most spectacular scenery in the region. You can discover the beautiful coastline of Costa da Caparica with its natural sand dunes and picturesque beach bars on the local beach train called the 'Transpraia'. The trip takes you along the Costa Caparica Coast, perfect for discovering surf spots, playing beach volleyball, chess, or just relaxing at empty, pristine beaches. In Caparica you can rent bikes for 3 € an hour or 6 € a day. With the super comfortable beach cruisers or Mountain Bikes available to our guests. You can ride around the town of Caparica, or explore the 13km stretch of coast heading towards Lisbon with or without your surfboard. We’ll give you a lock so if you find that perfect wave along the way you can stop. You also have the option to explore some of the many dirt tracks along the coast on our new Cube Mountain Bikes. If you, or a group of you, don’t have a car but want to check out some surf spots further up the coast at places like Peniche or Ericeira, feel free to ask the team. Not only can you rent surfboards from the lodge, but also bodyboards and SUP (Stand Up Paddleboards) If there is interest the team can even take you on a guided tour around the coast on the SUP’s to check out some secret beaches and jump of some cliffs into the Atlantic. 1 week including breakfast from 229€! Arrival and departure possible any day during the Low Season. Prices when surf trips are not exactly 1 or 2 weeks are calculated using the per night price. Incase your travel dates fall within two seasons, the travel cost will be calculated accordingly. During Peak Season arrival and departure only on Saturday. We offer an extra service where we will find you a cheap, available flight. We’ll double-check the prices and availability and will contact you with the final offer. Cheap flights are available starting from as little as 80 Euro! Best option is to fly directly to Lisbon (LIS) and then book an airport transfer. RyanAir and Easyjet provide cheap and easy ways to get to Lisbon, Portugal from most airports in and around all major centres in the UK. An airport shuttle can be organised to pick you up from Lisbon Airport, and take you directly to Caparica and our Surf House for 35 € per trip, the cost is split evenly between the number of passengers. Max passengers 4, so 8.75 € per person. From Lisbon Airport (LIS) you can hop on the Red Metro line until you get to Alameda. Once there change onto the Green Metro and take that until Praça Areeiro. There, you get on the Bus number 161 headed to Costa da Caparica (Mercado) . Then you can walk the last 10 minutes to Eco Surf Lodge Caparica. Or you take the Aerobus from Lisbon Airport to Cais do Sodré. From here you cross the Tejos on the Ferry in 7 Min. to rech Cacilhas. Here you get on Bus 135 to Costa da Caparica and get out at Mercado. From here its 7 minutes walk to the Eco surf Lodge. We recommend renting a car! In Portugal there are very cheap rental cars available that start at 80€ per week. At Sunny Cars you'll find the cheapest rental cars around! Getting a rental car will allow you to spontaneously explore the coastline or nearby Lisbon.It will also give you the freedom to take early morning drives up the coast to go to your favourite surf spot and be first in the water.